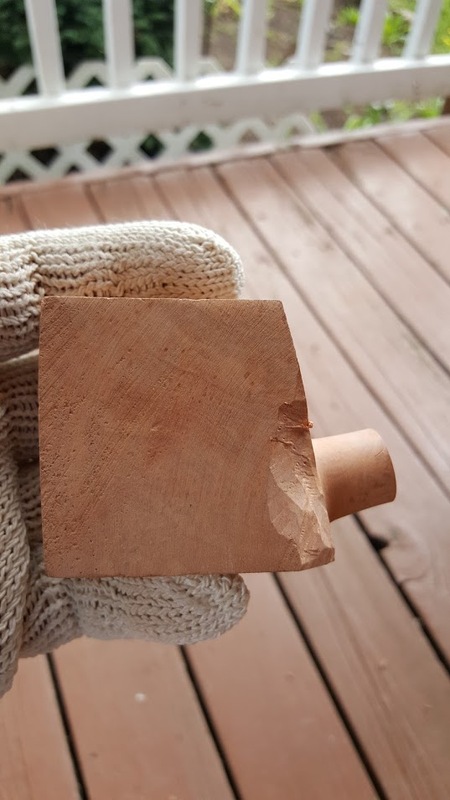 Actually, this is my son’s pipe that I made. In woodworking, I have always had problems with finishing the project. For some reason, I can bend metal or carve very intricate things without issue. Getting it to look all nice and shiny after I am done has always been an issue. The folks over at Woodcraft actually steered me in the right direction this time. Load up a polishing wheel on my bench polisher. Polish up the pipe using several loads to the polishing pad. Coat the pipe, let it dry, and then buff it back out. I still have to do the final polish/buff on the pipe and apply a couple more coats. It did turn out really nice, however. The final wood color was only a shade or two darker than when the wood was wet. The color and the way that the grain was made to just pop is really exciting. Both of the other blanks I did had a much lighter colored wood. With the etching that Jerry is doing I am thinking a dark stain to the etched area and then use this polish for the rest will be perfect. Due to my son’s inability to wait to test the pipe out I still have another coat and some polishing to do on this build. He said that the draw was actually quite nice and the tobacco stayed lit longer than his other pipes. This made me feel pretty good about the time and energy I spent building this thing. Again, just load your pad and go to buffing. It will polish and apply the finish all through the use of the buffing wheel. 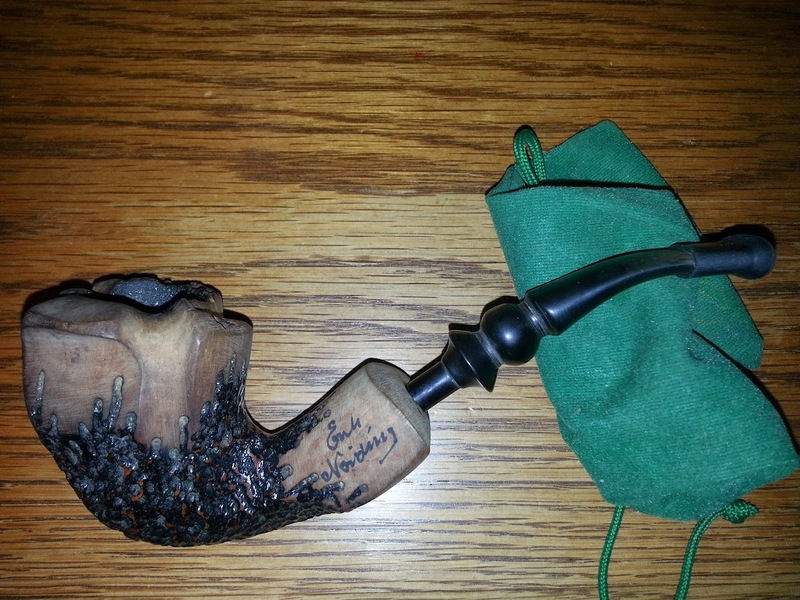 This entry was posted in DIY Projects and tagged diy pipes, pipe, pipe building, pipes, tobacco pipe on July 22, 2016 by Woodsbum. Well, the wife has another reason to be completely annoyed with me. I discovered that there is ANOTHER way for me to waste time and money. The pipe store has drilled briar wood pipe blanks. That is correct…. PIPE BLANKS!!!! Now I not only have the opportunity to sit and smoke my pipe, drink beer, and hang out with my dog. I have the opportunity to make it look like I am doing something OTHER than smoking my pipe, drinking beer and hanging out with my dog. By finding these little gems I now look like I am working on some sort of project. The pipe blanks are actually pretty simple. The stem is already set as are all the drilled holes. All that is required is some elbow grease to form the bowl. Here are some pictures of where I started and the progression until almost completed. It is not done yet because I have to get my friend to etch in a Navy Chief’s Anchor onto it and then polish. After some sanding, filing and carving, I got to this point. Here is another angle after some more carving, filing and sanding. Although I have got it to the point where I am ready to do final sanding and polishing, I want to wait until I get it actually done in case I have to go back and fix something. These pipe builds are actually pretty sweet. Thus far I have got 3 to the point where I just need to polish them. The shape for all 3 has been the same, but I will soon be doing some creative work on one or two. Although I am not fond of straight stem pipes, I will probably grab one because that is all the local store has left in stock. I can do a shorty, rounded bowl straight pipe that won’t look too bad. Once I get the polishing done I will post some more pictures. 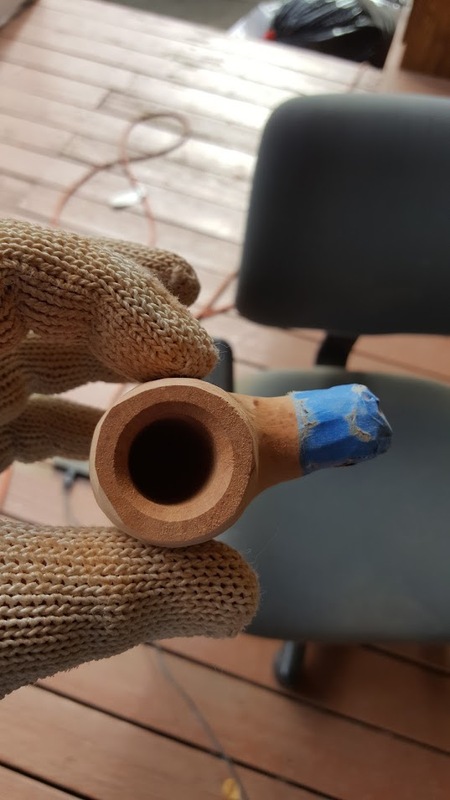 This entry was posted in DIY Projects and tagged diy pipes, pipe building, tobacco pipe on July 21, 2016 by Woodsbum. For many years I was a cigar smoker. Although I love the taste, feel, and aroma of a good cigar the price really put a damper on the various types and amount that I could afford. Even with the lowered price of bundles or seconds it was way too expensive of a vice for me to really partake that often. 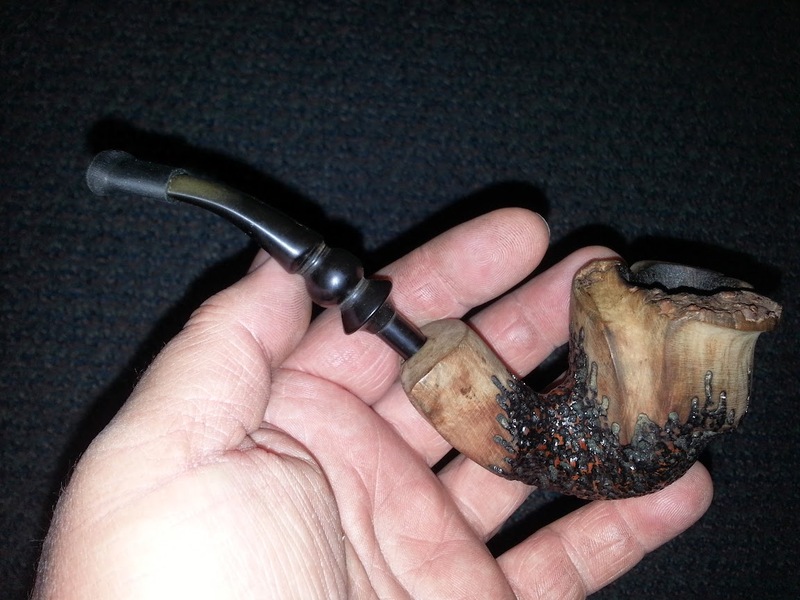 That was when a friend of mine gave me an old Savinelli pipe that he no longer used. From then on I found that the price of pipe tobaccos gave me the variety that I craved with the lowered costs that I required. 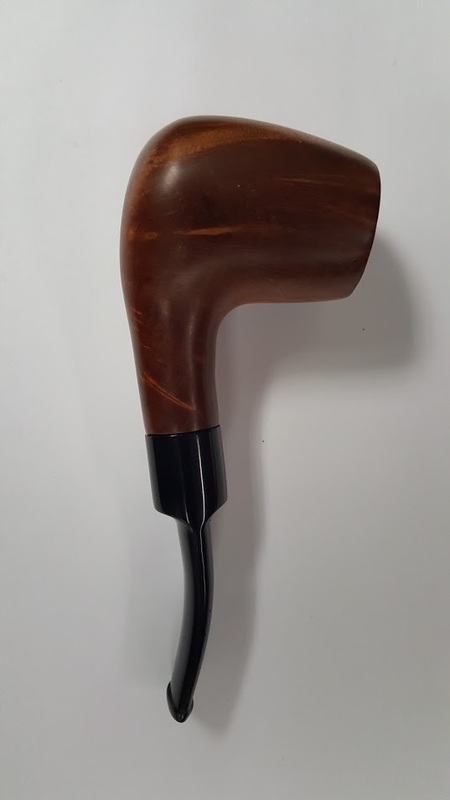 As years went by and more and more pipes found their way into my collection, I stumbled across a very nice looking Erik Nording. Although I am anything but a pipe snob, I was actually quite proud to have this beautiful piece in my collection. 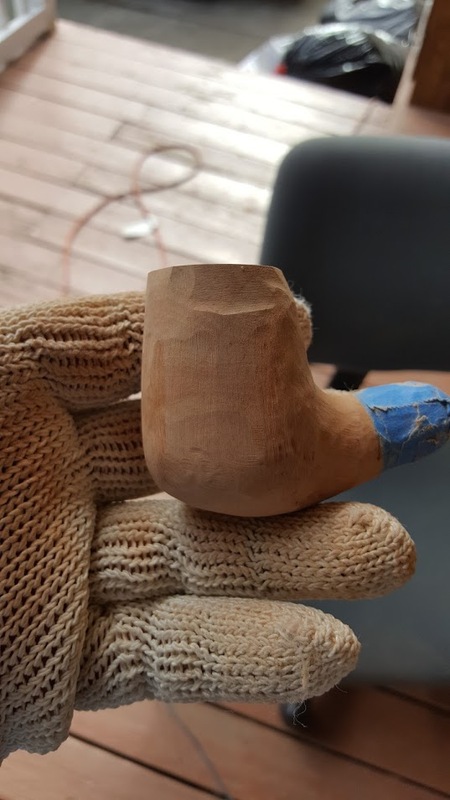 Between the draw, the way the heat maintains an even tobacco burn, and the lack of moisture that builds up this has become my favorite pipe by far. As you can see, the stem comes apart quite easily for storage and transport. This makes it the perfect pipe for taking with you on outings. The tobacco shop where I bought this actually has extra stems for sale in case you break one. This also is a nice feature of this pipe. Over the years I have become quite fond of the up swept pipe shape. It cuts down on the amount of “juice” that travels up the stem when you get fresh tobacco. I am sure that there are all sorts of techniques to keep this phenomenon from taking place, but I sure have not been able to keep it from happening with any regularity. This is why I only make churchwarden style pipes for myself and am really fussy about the pipes I purchase. If I could find a pipe that had a “juice” bypass valve, I would be all over it. The other thing I have discovered is that I like pipes that are big and bulky. I am not too fond of the smaller, dainty models. Maybe it is because I have bear paws for hands, but the actual smoke and draw just seem to be that much more pleasant with a larger pipe. Again, I am not a pipe expert and am self taught via trial and error. There are many things that I am sure that I am doing wrong, but I don’t care. Smoking a pipe isn’t a status thing for me nor is it something to make me “look cool.” It would take much more than a pipe to make me even remotely close to “cool.” I enjoy the different flavors, aromas, tastes, and relaxation that smoking a pipe provides. Spend some money on a good pipe. A $40 pipe will not give you the experience that a $200 pipe will. I don’t know the physics of it all, but I know from personal experience that any cheap pipes that I have purchased have either been intentionally “lost” or given away. The most expensive pipes give a much more pleasant smoking experience. Making your own pipe is a close second to an expensive pipe purchase. Just make sure you make the stem long enough to cool the smoke properly. Otherwise you get a burned taste from the smoke and the flavors of the tobacco are lost. Get good tobacco. DON’T BUY PREPACKAGED TOBACCO. Go to a cigar shop and look at the glass containers for your tobacco. It is 200x better tasting and burning. Get a good pipe lighter. The cheap Bic lighters seem to be only capable of successfully burning my fingers and can barely light the bowl. Some can make it work, but I can’t. I doubt new pipe smokers can either. Don’t think of it as a cigarette. It is more like a cigar. Don’t inhale the smoke. Play with it and taste it. This also adds to the relaxation and enjoyment of the pipe smoking experience. I hope this helps you out if you decide to try pipe smoking or have been thinking about getting a Nording pipe. Both are highly recommended by me. 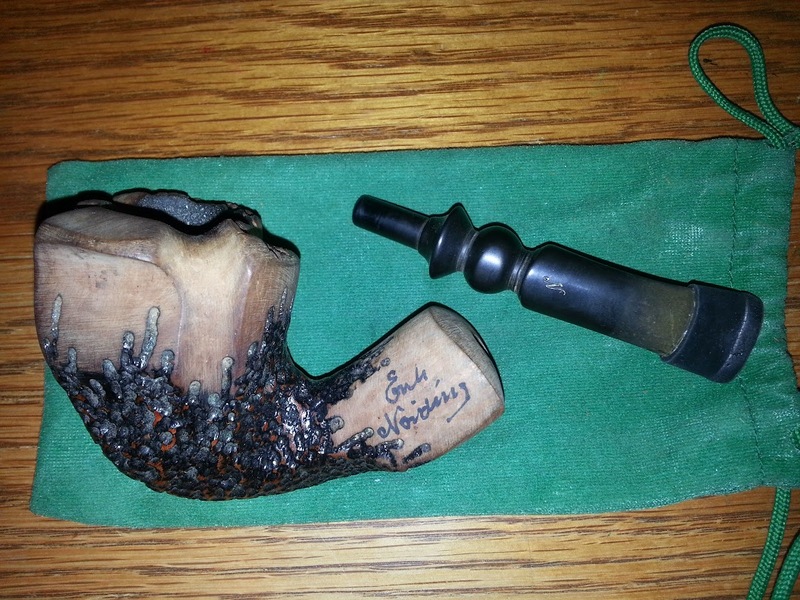 This entry was posted in Camp Techniques, Miscellaneous and tagged Erik Nording, Nording pipes, pipes, smoking pipes, tobacco pipe on May 13, 2015 by Woodsbum.